Firing is a clumsy thing to teach in a class, even a workshop. Hours of attentively doing nothing is punctuated by tens seconds of activity, followed by more nothing. My undergraduate program didn't really cover firing; we focused on wetwork, placed the pieces on a rack, and then they went away. When they came back they were changed. I'm exaggerating a little bit; I remember a few occasions when the professor called us into the kiln room to observe the length of a flame, or to peer through a port at falling cones. Still, it was hard to put those bits a pieces into any functional knowledge of firing. My graduate program was very self-directed, and it was assumed that students already had this basic skill; I was too embarrassed and shy to admit that somehow I had gotten a BFA without knowing how to fire a gas kiln, so I watched other students, shared firings with them, asked my professors questions that I hoped were not too stupid, and muddled through. Yet compared to learning to fire, learning to throw was a walk on the beach (and believe me I was no natural in that department, either.) So I thought I'd share a little bit of my firing practices, and maybe help someone else along. This may or may not be useful with any given kiln; some things seem universal, such as a lesser back pressure out of the lower spy. • First things first: Cone packs. Make them far enough ahead that they are bone-dry for the firing. I'm trying to get in the habit of making a bunch of cone packs at a time, so there will always be dry sets ready. I use cones 012, 05, 3, and 6 in the low pack, and cones 8, 9, 10, and 11 in the high pack. I only make two sets per firing, one for the top spy and one for the bottom. 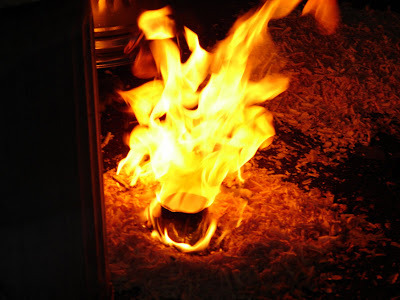 Some potters use four or more, because they have more spyholes, or because they want more information about the relative temperatures in the kiln. 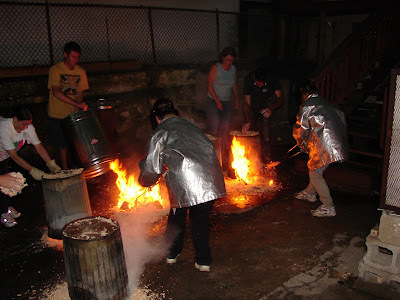 • Candling: After loading, many potters candle overnight with just the pilot burners on. I always did, but lately I have been questioning whether that is strictly necessary. It's convenient, as it allows the kiln to safely climb overnight with no attention, shortening the time that the potter has to be engaged with the firing, and allowing the loading to be done on one day and the firing the next; but with the costs of propane, and the negative effects of burning fossil fuels, I've decided to try skipping over the candle, or rather, shortening it to about two hours. The firing that I am doing right now will be the first to skip this step. Needless to say, if your cone packs are not bone-dry, you will need a candle of longer than two hours. I have seen cone packs explode in the early part of a firing. It was not funny. After my minimal candle, I will turn the burners up little by little until they are as high as i can get them without entering reduction. • Body Reduction: I enter body reduction at 012, which is earlier than many potters do, but in my experience, good copper reds are achieved in an early body reduction. No amount of reduction later in the firing can make up for missing this critical window. I try for an eight -inch flame in the top spy, and a steady flame of any length in the bottom. 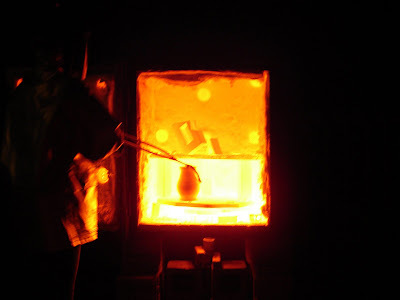 Depending on the kiln, reduction may be increased either by turning up the gas or by pushing in the damper. 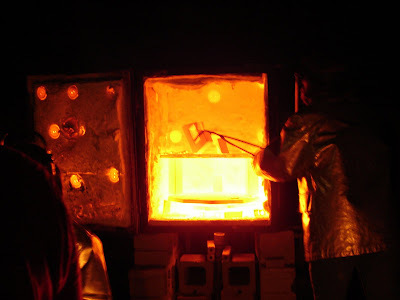 Keep an eye on it: as the kiln gets hotter, it may consume more gas to maintain temperature, and a kiln that was in reduction may take itself out. I stay in body reduction until 05. If the kiln is not climbing at all, the reduction may be too heavy. Keep it where it is for twenty minutes, then back off the damper (or the gas) a little, until it starts climbing. • The Climb: Though I go out of body reduction at 05, I keep the atmosphere lightly reducing. I want to see an intermittent tongue of flame out of the bottom spy. Again, it needs monitoring, but it can stay like this until cone 8. Cones 3 and 6 are just to let me know where I am in the firing, and to determine if the kiln is firing evenly. 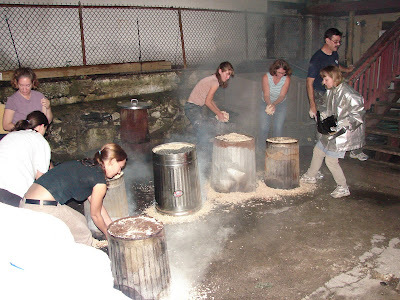 • Brief Clean Flame: I pull out the damper and fire in oxidation for about 30 seconds. Be careful with this! If your kiln is too small or too loose you can re-oxidize half your load. 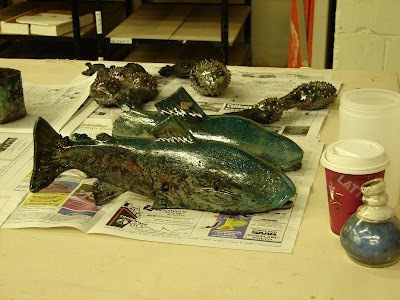 I'm firing a 25 cubic that is nice and tight; otherwise, I'd go shorter on the clean flame or skip it altogether, although I find it makes my glazes more brilliant, somehow. Whew!! That's a lot of writing, and it's time to bump the burners up. 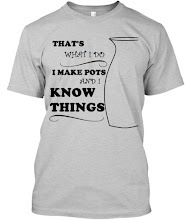 I hope it helps someone, but remember, all kilns, glazes, clay bodies, and potters are different. Thanks to Douglas Fitch for the image.